In team collaboration, to share a diagram with teammate means to let him or her view the shared diagram, either through a web browser or through mobile device, and to allow him or her to give comments on the diagram, or shapes in the diagram. At the top of the PostMania Topic Pane, click Share and then select Invite Viewers… from the drop down menu. 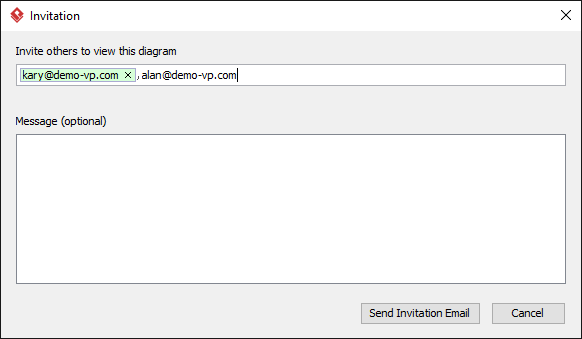 Click Send Invitation Email. PostMania will send the invitees invitation Emails in three minutes.Note: If the invitee is an existing viewer, and has opened the notification page/view of PostMania, either in a web browser or in Android apps, he/she will not receive the email notification. At the top of the PostMania Topic Pane, click Share and then select Share Layers… from the drop down menu.